Lucy de Vere was the founder and first prioress of the Benedictine nunnery of Hedingam in Essex. When she died, probably around 1225 her successor, Agnes, sent this roll -- now over 19 feet long and composed of several strips of parchment sewn end-to-end -- out to other religious houses, announcing Lucy's death and asking them to pray for her soul. As it passed around East Anglia and back and forth across southern England, each of them added an inscription asking for reciprocal prayers (tituli). This section (tituli 70-74) displays a relative uniformity of handwriting styles. 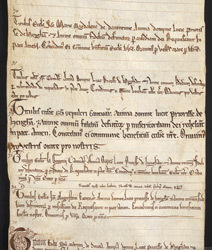 Most of the tituli on it were written by communities in Canterbury and, because of the high level of skills of their scribes and their need for impressive documents, the majority of the tituli are written in formal styles, such as charter styles or the formal style used for liturgical books. The religious houses include the cathedral (Corpus Xi or Corpus Christi), Holy Sepulchre, St Gregory and St Augustine.